Bladder cancer develops when cells lining the urinary bladder become abnormal and grow uncontrollably, forming tumors. A new treatment headed towards human testing was successful in killing multiple types of human cancers when transplanted into mice. Cancer is an insidious disease that has become more prevalent in society as people live longer and standard treatments are pretty much the same that have been used for the last 50 years. Researchers have studied the genetic makeup and gene expression profiles of hundreds of thousands of tumors and cancers to determine if there are targets that can be attacked. This line of thinking has resulted in drugs for breast cancer such as Herceptin, which is an antibody that attaches to the HER-2 protein on the surface of cells in 10 to 20 percent of breast cancers patients. The antibody attracts the immune system to attack and kill off the cells that are cancerous and express high levels of the target Her-2 receptor. Researchers are ever vigilant and are always on the lookout for new targets for so called "immuno-therapy." This is why an editorial in the highly respected journal Science and a research paper published in the Proceedings of the National Academy of Sciences has drawn so much interest in the oncology field. Researchers have previously noticed that a specific surface marker, called CD47, was expressed at high levels on cancer cells and cells in the blood. They found that this CD47 molecule signals the immune system to 'not eat me,' and protects cells from being killed off. Cancers use this flag to evade the immune system and hide while it grows and eventually spreads through the body, ignored by the immune system. Recently the lab of Irving Weissman at the Stanford University School of Medicine in Palo Alto, California has treated mice with leukemias and lymphomas with an antibody that blocks and effectively hides this CD47 marker and calls on the immune system to attack and kill the cancerous cells. Now in the most recent publication, Weissman and his research group has gone a step further and tested multiple types of human cancer cells including breast, ovary, colon, bladder, brain, liver, and prostate tumors in petri dishes and in mice to determine the effectiveness of this 'Anti-CD47' antibody treatment. In vitro, in petri dishes, researchers found that when they blocked this 'do not eat me' signal, macrophages, a type of immune cell that eats harmful cells and bacteria, killed and ate the cancer cells. 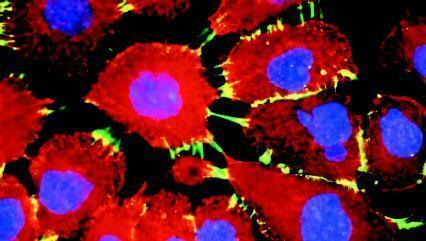 And without the drug, the macrophages ignored the cancer cells completely. In mice, researchers transferred multiple types of human cancer cells, which would normally grow large, metastasize and eventually kill the mouse. Yet, the mice treated with the drug all had shrinkage of tumors, no evidence of cancer spread to lymph nodes and remained cancer free for four months after researchers stopped the treatment (when the experiment was completed). From the Science editorial "In mice given human bladder cancer tumors, for example, 10 of 10 untreated mice had cancer that spread to their lymph nodes. Only one of 10 mice treated with anti-CD47 had a lymph node with signs of cancer." The editorial continues: Cancer researcher Tyler Jacks of the Massachusetts Institute of Technology in Cambridge says that although the new study is promising, more research is needed to see whether the results hold true in humans. "The microenvironment of a real tumor is quite a bit more complicated than the microenvironment of a transplanted tumor," he notes, "and it's possible that a real tumor has additional immune suppressing effects." Weissman's research laboratory has received a $20 million grant from California Institute for Regenerative Medicine to move from mouse trials to safety tests in humans (Phase I trials). "We have enough data already," says Weissman, "that I can say I'm confident that this will move to phase I human trials." The research published in the Proceedings of the National Academy of Science can be found here.